One of my resolutions for 2010 is to eat cleaner. We eat fairly clean, but I’m always looking for new recipes. I was looking at Clean Eating Magazine and came across this recipe. I made it tonight for dinner and it was so good! My daughter kept saying how yummy it was and ate everything off her plate! In a large skillet, heat olive oil over medium heat. Add onion and cook until softened, about 5 minutes. Add garlic and cook another minute. Turn heat to medium-high and add ground turkey, breaking it up with a spatula until meat shows no sign of pink. Stir in cinnamon and nutmeg, then add tomatoes and salt. Reduce heat to medium-low, stir, cover and let simmer for 20 minutes, occasionally stirring and breaking up tomatoes with a wooden spoon. Meanwhile, bring a large pot of water to boil. Cook pasta according to package directions, drain, rinse and allow to cool in a colander. Preheat the oven to 400°F. Squeeze all remaining moisture from thawed spinach and place in large bowl. Add ricotta cheese, egg and a 1/4 cup mozzarella cheese to bowl. Stir until combined. Spread 1 cup of cooked tomato sauce into bottom of a 9″ x 10″ casserole dish. Lay a cooked lasagna noodle flat in front of you. Use your fingers to spread 1/8 of ricotta mixture across the noodle and roll it up. Place the rolled pasta seam side down, into the casserole dish. Repeat with remaining noodles. 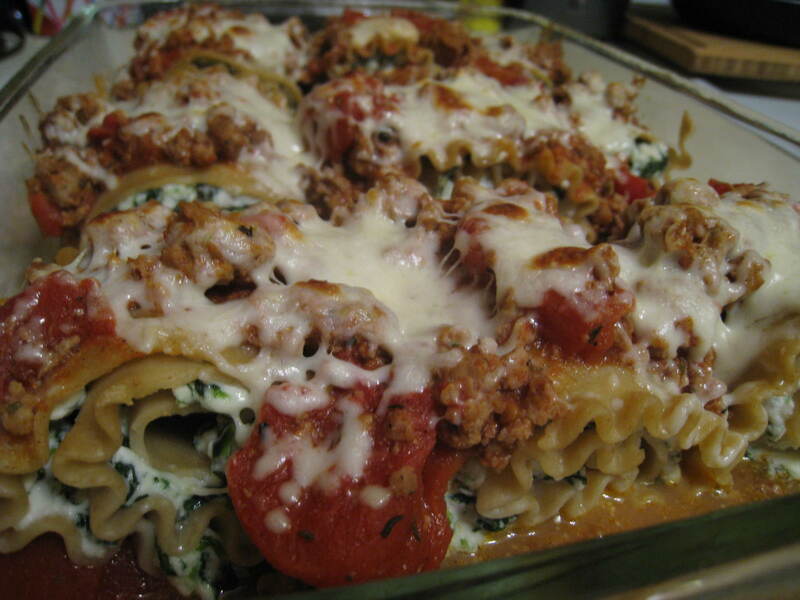 Spread remaining tomato sauce over roll-ups, then top with remaining 1/2 cup mozzarella. Bake, covered with foil, for 20 minutes. Remove foil and broil for 5 minutes or until the rollups are browned and bubbly.